The Full Spectrum Birthday Song captures the essence of feeling-friendliness in a narrative that springboards from the topic of birthdays, a dynamic time that stirs all manner of feeling. This musical learning tool is an invitation to celebrate all feelings every year, every day, every moment. The Full Spectrum Birthday Song was first launched for partnerships between Emotion Literacy Advocates and twenty-three social service agencies in Oregon, Idaho and Washington. Through these agencies, ELA’s song found integral application in multiple settings, for those working with children, parents and teachers. 8,000 CDs were requested and provided by generous ELA program sponsors included in the list shown here. 6th Annual Educational Resource Street Fair in Seattle where inquisitive children came to our table to reflect upon and talk about emotion and to receive ELA’s birthday song as a gift. 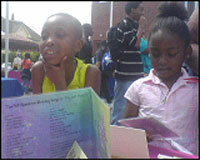 Read more about this traveling innovation in community education-as-gift here. Just as a point of information, I reviewed the CD for the family partnership program in my car on the way to an event, my nine-year old grandson (who I am raising) loves it! He can listen to it over and over again for, literally, hours…thanks so much for your generosity. The Full Spectrum Birthday Song CDs were sent out to (325) families and community partners (with their quarterly newsletter). I wanted you to see the e-mail from Kelly DeLany, Oregon Post Adoption Resource Center Program Manager. The responses have been so positive. Thank you! We just received the latest edition of Kidbits with the lovely enclosed CD. I’m playing it now over and over… I found The Full Spectrum Birthday Song laughter-inspiring and intriguing and it certainly covered the full range of birth feelings. I personally plan to play it at our next family birthday event and make it a ‘full-spectrum celebration’. I have asked Jennifer Ricks to consider including it in her Positive Parenting training. I gave out the CDs to most of my families last month. This month I am asking if the children enjoyed listening to the CD. So far, it has been a positive hit with the children. They want to listen to it several times over. This CD is introducing vocabulary and is building self esteem—making the children feel good about themselves…both child and parent listen to the CD together, this also gives the parent some tools of how they may talk to their child. Thank you for sharing your CD with so many families of young children. The Full Spectrum Birthday Song (or Why Just Happy?) will be a great asset to any wish granted here. These (CD’s) will be given to children whose birthdays fall on the day of their wish as a ‘wish perk.’ We listened to the CD and found it very innovative and inspirational. 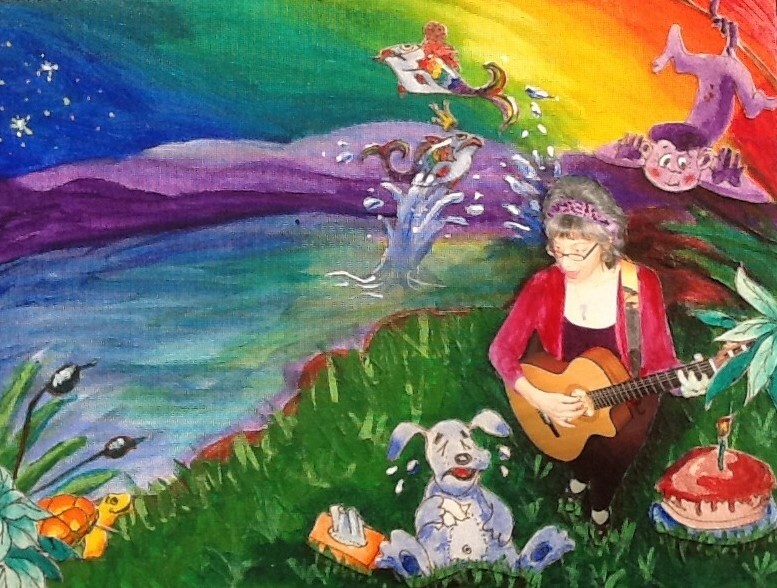 Pamela Sackett’s Full Spectrum Birthday Song is a wonderful song of celebration—not just of one’s birthday, but of one’s range of emotional expression, abilities & possibilities. We acknowledge and honor children’s feelings and encourage them to express their feelings—that it’s ‘OK’ to feel happy, sad, angry, etc. Pamela’s Full Spectrum Birthday Song communicates these same values in a creative, musical and thoughtful way! You did good…The Full Spectrum Birthday Song CDs work really well in several of our classes and we’ve shared them with other agencies that serve parents! We hand out The Full Spectrum Birthday Song CDs at classes as part of our curriculum. Children are learning the song, moving to it and playing instruments with it. The Full Spectrum Birthday Song is fresh and brings so much more to the meaning of celebrating birthdays. The song and music are a real work of art. Much soul and inspiration for celebrating all of life comes through even in just that two minute sample online. 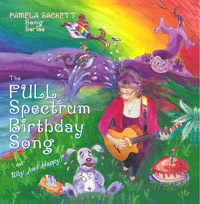 Pamela’s song reminds us of so many possibilities…let The Full Spectrum Birthday Song become the new tradition. My three and a half year-old daughter loved the imagery in The Full Spectrum Birthday Song and requested we play ‘that other birthday song’ again…why settle for ‘happy’? The Full Spectrum Birthday Song encourages exploration of all manner of birthday sentiments. Birthdays are a time when we celebrate the passing of a year and the beginning of a new one. Each year has it’s ups and downs and in the acceptance and appreciation of these fluctuations, we find the immensity and deep meaning and joy of life. Pamela’s song asks why just a ‘happy’ birthday? Why not celebrate and love the whole reality of living? It’s a simple song, humorous and one with a message as profound as the ages.